Could you suggest a sightseeing itinerary for a tour please? 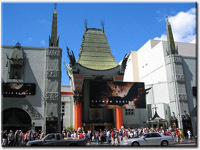 We will start our signature Los Angeles City Tour by visiting famous Grauman's Chinese Theater via Hollywood Blvd., where you will gaze at the Walk of Fame and view hundreds of foot and hand-prints of stars such as Marilyn Monroe, Eddie Murphy, John Wayne, and many more. The Hollywood Sign is framed by an Egyptian-style arch and numerous architectural elements including two huge sitting elephant sculptures on top evoke the glitz and glamour of an earlier era. Stop at the Walk of fame for about 30 minutes. After that we will cruise the Sunset Strip on our way to the Farmer's Market and the Grove where you will experience a shopper's delight, taste sumptuous foods around the world. Stop there for about 30 minutes, time for a quick lunch. Then we will be touring city of Beverly Hills which offers all of the glamour and opulence that anyone could reasonably hope for, including Rodeo Drive, probably the wealthiest and most famous shopping district in the world, many frequented by movie stars, The Beverly Hills Hotel ("The Pink Palace"), The Beverly Wilshire (where "Pretty Woman was filmed). After that we will visit a beautiful city of Santa Monica on ocean, where your children can enjoy some rides on Santa Monica Pier. Stop there for about 40 minutes. At the end of the tour we can bring you back to the hotels. Our tour is an excellent way to get to know Los Angeles and surroundings. During the group tour, we can accommodate any reasonable requests you might have. We always treat our guests as personal friends visiting Los Angeles for the first time. Please do not hesitate to ask any questions. You can send us e-mail to info@latraveltours.com or call 1-800-761-1775 for more information. "Your personal Los Angeles guide"
pickup also available from Los Angeles port cruise terminal, Long Beach cruise terminal, Burbank airport. Additional options: visit Universal Studios Hollywood, Getty Museum, Staples center, Warner Brothers VIP Studio Tour, Santa Barbara and San Diego Tours.